"The knock 'em dead role here is Jennifer Bernstone as Grace.... Her fine voice and control of mercurial mood shifts were impressive." 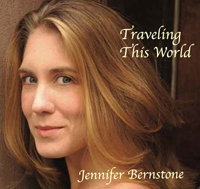 "...the voice of a nightingale...."
"Jennifer Bernstone's eloquent voice... is a highlight of the evening." "...the voice of a nightingale..." only begins to describe the beautiful tones and vocal stylings of Jennifer Bernstone heard in each masterfully performed piece.